Sadie Hoffmiller is enjoying her time in Santa Fe, New Mexico as best as she can. She would rather go home and spend time with her boyfriend Pete, but she knows that there’s a killer after her, so she tries to make the best of staying in New Mexico. She stays busy by being an undercover informant for the BLM, which involves lots of digging in the hot, dusty desert and getting to know knew people. She’s staying with Pete’s cousin, Caro, who shares Sadie’s love of baking and learning lots of new recipes to put into her black book. Sadie runs into trouble, it always seems to know where to find her, one day as she’s digging at the dig site, when she and a co-worker, Margo dig up a couple of new dead bodies, where there’s only supposed to be really old ones. This is the start of craziness for Sadie, before the craziness is over there will be several more dead bodies, Margo will be missing and Sadie will have hopefully recovered her prowess for detective work before it becomes too late for her. I loved this book! I’m so glad that Sadie got her mojo back, she really didn’t feel like herself in Banana Split, but in this book she’s got her spunky, take charge attitude back, plus she’s making some amazing recipes. I thought that it was kind of fun to see some QR codes sprinkled throughout this book. 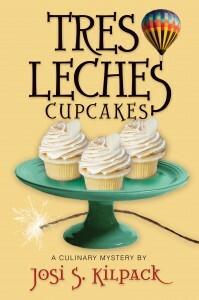 I can’t wait to get the recipes from this book at Josi’s website, there were several that I want to try, including the Tres Leches Cupcakes recipe, it looks amazing!